Heflin, Santa Ana, California USA 1965 photo depicts a flat-top "straw hat" saucer - magnified photo #1, all 4 photos @ rr0 (french). To the general public, it is perhaps the best known shape of what a UFO may look like, as it was included in encyclopedia Britannica's 1966 yearbook, classified under "spacecraft". Second generation copies of Helfin's photos (the originals were taken from him by two men claiming to be from NORAD) were repeatedly analyzed at the time, by NICAP, by atmospheric physicist Prof. James McDonald and others. With some exceptions (e.g. 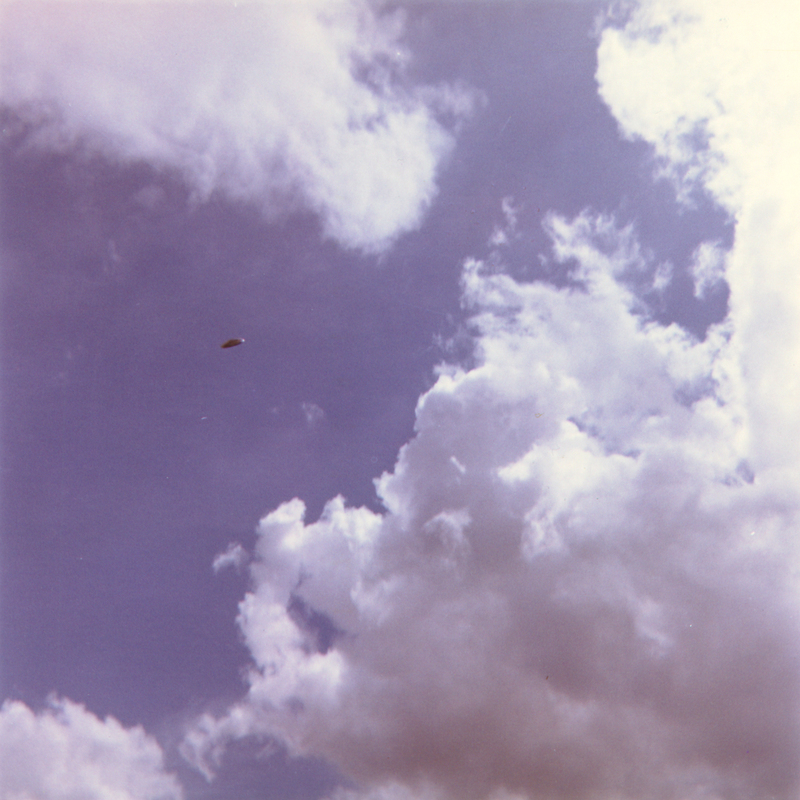 D.Rudiak), the consensus among UFO researchers is that these photos show an authentic UFO. Latest re-analysis of Heflin USA 1965 (.pdf) published in 2000 in JSE includes all 4 photos. Related: The UFO in the Heflin photos resembles those photographed in Kluj Romania 1968, Belotie Yugoslavia 1974, Kosina, Hungary in 1996 cases. Other cases describing similar objects is the A.C. Urie, Snake River Idaho USA 13-Aug-1947, more @ brumac, Craigluscar reservoir Britain 19-Feb-1994. Watch: Heflin interview 30 years after the event. He sticks to his story and maintains the authenticity of the photos. Lynn, MA USA 11-Dec-2006 by Fredrick N., two photos of a dark oval/egg-shaped UFO (which is one of the common shapes seen near the ground since the 1950s), flying with the long axis vertical, taken with a digital camera. Note: Erratic, violent maneuvers are the distinct characteristic of UFOs. Eye witnesses may use terms like "zig-zagged", "zipped around", "hopped around", "dancing around", "bobbed and weaved", "yo-yo'ed" etc. These two photos will help us to visually identify certain (speculative) concepts about UFOs (covered in sections #7, #8 and #9 of the main part of this page, and the extract from P.Hill's book on UFO illumination and colors). 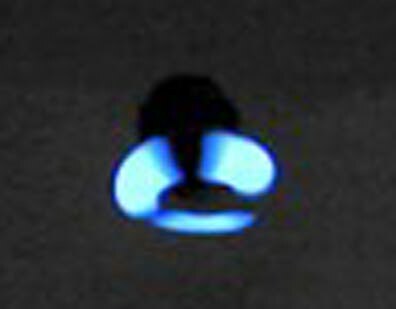 Notice that both photographs show a bluish glow under the UFO (which is often interpreted as "flames" or "exhaust fumes" by eyewitnesses). This illuminating sheath of atmosphere around the UFO is a sheath of ionized and excited air molecules, known as "plasma" in scientific literature. This plasma is generated by EM radiation accompanying the UFO's force fields, used for propulsion and air-control. Because of the difficulty of creating plasma at normal atmospheric pressure and temperature, in addition to other confirming observations, such as a) the luminosity of some reported submarine UFOs b) the sudden appearance of "mist" or "cloud-like substance" around UFOs when they startup in high humidity environment, apparently as water vapor adjacent to the UFO is condensed by pressure from a force-field c) the occasional violent sound effects (roar) at startup, while being practically silent in flight d) and the physical effects as UFOs enter/exit the water it seems that UFOs "airflow control force field" (ACFF) creates an envelope of lower atmospheric density (near vacuum) close to the UFO's surface, by pushing the surrounding medium (air/water) away from the skin of the UFO. The basic idea is that UFOs prevent aerodynamic heating, reduce drag and suppress shockwaves (sonic boom) by utilising their acceleration-type force field technology for propulsion, as well as for controlling the surrounding air (or water). Hill refers to the latter as "airflow-control field". Another way to think of it is using the same principles as a incandescent light bulb: UFO craft is the filament and the bulb is the air-control field around it, which protects the UFO, keeps the surrounding medium (air/water) from coming in touch with the UFO. This minimizes friction and heating issues. Below: In the #2 photo, note that the three (3) bluish neon-light-like glowing areas appear at some distance around the underside of this oval craft, and are spaced at 120° apart. [better visible in 2nd photo enlargement] It is not the UFO itself emitting light, but an envelope of ionized air (a/k/a "plasma sheath") around it. Interpreting this photo according to the ideas outlined in section #8 on Radiation, i.e. that UFOs' ionizing EM radiation (which creates the glowing plasma), is coincident with the UFO's gravity-like force-fields, the 3 zones of glowing air below this UFO may be revealing the position and direction of the propulsive fields of this particular UFO at that moment in time. Story: The witness was sitting on the passenger's seat, taking landscape photographs under the rain when suddenly this luminous disk appeared. The photograph is from the UFO files of the French Gendarmerie Nationale. Notice the strange cone-shaped effect under the disk. This might be the luminous "ion cone" effect, often reported under disk-shaped UFOs. 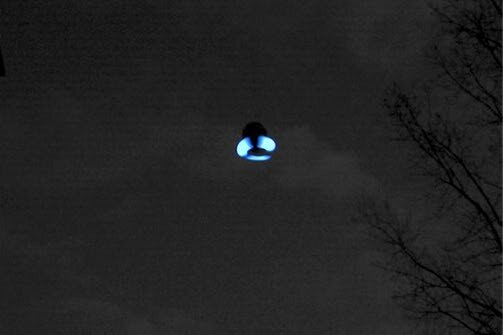 When viewed from a distance at night/twilight, people might describe diskoid UFOs as a "luminous icecream-cone" or "flash-light pointing downwards" shape. One such incident was the Portage County 17-Apr-1966 case, when Ohio cops chased a UFO for over an hour, into Pennsylvania, See: police officer Spaur sketch of lenticular disk with luminous cone under it (portals: wiki, ufologie, ufoevidence). As Paul Hill points out in his book, the luminous air ionization is about coincident with the gravity-like force field used for the UFO's propulsion system. Interpreting Col. Mikhailovic's report according to the ideas outlined in sections on UFO Propulsion and Radiation, what he perceived as 'rigid ray of light' which rocked his plane, was probably a column of ionized air, created by the EM radiation which accompanies the UFO's gravity-like propulsive force field. The latter was the source of the mechanical effects, i.e. the shaking of his plane. Related: Cases of similar flat-bottomed disks include the cases of e.g. Fregnale, Lac Chauvet - Auvergne France, 1952, Rogue River, USA 1949. Recent (unverified) cases of daylight disks include Roberto di Sena, Alagamar Brazil, 26-Nov-2006, Redondo Beach, CA USA, 31-Mar-2007. 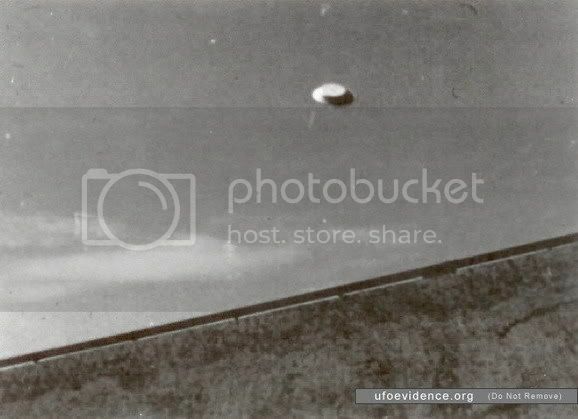 Albiosc Tavernes, France 1974: A widely published UFO picture from France. The four (4) white "beams" under the UFO might be columns of ionized air, excited by high energy e-m radiation accompanying the UFO's propulsive force field, in which case they reveal the locations where the propulsion fields emerge (for this particular UFO). Similarly, the orange-colored "plasma sheath" surrounding this UFO radially, might be due to ionization by the e-m radiation accompanying the "airflow-control field". The Zdany, Poland 8-Jan-2006 UFO Photos, an example of walnut-shaped UFO i.e. "flattened sphere with ring at the equator". Reportedly the object immobilized two cars, and was moving extremely swiftly and without noise. A series of photographs taken, read more abour the Zdany UFO photos and story at ufoinfo and ufoevidence. Some of the best recent UFO photos. Related: This object very much resembles in shape -but obviously not in size- the UFO encountered by Japan Airlines flight JAL1628 on 17-Nov-1986. See pilot's drawing (taken from his official report), computer rendering of encounter, Maccabee analysis (big doc!) (ufologie). Also the object seen at Lincolnton, NC on 1-May-1985 at 21:30 (src: MUFON Journal Mar-86, p5). Lake Cote, Costa Rica 1971: A disk / shallow cone "conical hat" was auto-photographed in 1971 by a Costa Rican government mapping plane during an aerial mapping mission. The photo came to light in the 1980s, thanks to one of the crewmen who contacted local Ufologist Ricardo Vilchez. In 1985, a 2nd generation negative got in the hands of Dr. Jacque Vallee, who along with Dr. Richard Haines conducted an analysis which was published in JSE ("Photo Analyses of an Aerial Disc Over Costa Rica" (.PDF) and New Evidence (.PDF)). People have seen objects emerge from the lake in subsequent years. Related: Two similar UFOs, described as huge 600-700ft conical "coolie hats", were reported in a multi-witness encounter by the crews of 3 US Navy fighter bombers in Sep-1950 over Korea [more]. Another similar case is Lake Michigan 1981. Above: Example of a "ring" of scorched ground from a UFO landing trace case at Delphos Kansas USA, 1971 / photos taken 10min, 15hrs and 3.5 years after the event respectively. Note: although the Delphos case comes up on every list of UFO landing trace cases, it is atypical, as in that case the UFO seemed to also have ejected some sort of material, which caused the "self-luminous ring" on the soil -- Ted Philips talks at length about it, in the 30-Mar-2008 Paracast podcast. Over 3000 "UFO landing trace cases" of damage to the soil and plants where a UFO landed (or hovered low) had been recorded by 2006 in 70 countries by Ted Philips of Center for Physical Trace Research. A formally investigated case was at Trans en Provence, France, 1981 (Return to Trans-en-Provence (.PDF)), but such cases go far back, e.g. grass roots charred and skinburn of a Florida scoutmaster in 1952 is documented in Ruppelt's book Chap.13. A case with many witnesses is the Westall, Canberra Australia 6-Apr-1966 landing, where UFO was observed by staff and students of two nearby schools. Summary: This page covers the subjects of UFO shapes, types, colors, illumination, flight characteristics, speed, rotation, wobble, radiation, maneuvers, sounds, landing traces etc, with annotated examples of photographic cases of UFO sightings. This webpage aims to help the reader make some "technological sense" out of certain aspects of the UFO pattern (in particular sections #7, #8 and #9 covering UFO propulsion, radiation and illumination respectively). On a personal note, having spent a great deal of time researching the UFO subject, in this page I've attempted to include the info that I personally would like to have found, when I first started looking into UFOs in 2006. This page would have saved me a great deal of time. Some of the concepts are technical, but I've tried to present them in a language which nearly everyone should understand. Some key "take-home" points: UFOs often appear self-luminous, due to the ionization of the air around certain sections (e.g. saucers often glow at the rim) or the whole UFO, i.e. the air surrounding the UFO "lights-up" much like what happens inside a neon-lamp. This luminous ionization of air around the UFO is generally only visible at night/twilight, typically described as an "aura" or "fuzzy haze" of orange/yellow color, and it is also the cause of the "wavy like heat-haze" appearance of UFOs in daylight. Shapes and sizes of UFOs, as reported by eye-witnesses, change over time: Since the mid-1970s an increasing percentage of UFO reports has been of dark/black triangles and boomerangs, some incredibly large and reported all over the world (note: triangle-shaped UFOs have been reported at least as far back as 1950s, it's not a contemporary phenomenon). In recent years, the objects reported near the ground or landing are mostly smaller ones up to 5m (15ft) sphere / half-sphere / egg / triangle shaped, down to beachball-sized spheroid objects, in contrast to the predominance of larger objects, like the 5-10m (15-35ft) disks and ovals in previous decades. Finally, make special note of the UFO - water connection (underline it 10 times), i.e. reports of low-altitude UFOs near bodies of water (lakes, rivers etc) and the nocturnal character of most UFOs. lenticular saucer, convex on both sides ("lens-shaped", "like two soup plates / cereal bowls glued together rim to rim") occasionally with a dome e.g. USAF Air Intelligence report of a pilot spotting 4 landed disks near Tonopah Nevada in Nov-1957 p1 p2 sketch, Grand Beuch river valley, France, 1958, Dunellen NJ USA 1958, Trans en Provence, France, 1981, Harwinton, CT USA 1995 or the sighting often described US astronaut Gordon Cooper. More recently, the O'Hare Airport Chicago USA 2006 case, described as a "dark grey fattish disk like an M&M candy". flat-top, like a coin ("like a silver dollar"), or a coin with a rim (shaped like a "straw hat" / "top hat") e.g. photographic cases by Heflin USA 1965 (.pdf) or Kluj Romania 1968 or Belotie Yugoslavia 1974 or Kosina, Hungary in 1996. A US Air Force Intelligence report from 1951, describes the encounter of an F-51 pilot with a UFO. The object was described as "flat on top and bottom and appearing from a front view to have round edges and slightly beveled ... No vapor trails or exhaust or visible means of propulsion. Described as traveling at tremendous speed.... Pilot considered by associates to be highly reliable, of mature judgment and a creditable observer." nicap Other configurations are double flat-top "straw hat" ("like two circular rimmed pie-pans stuck rim to rim" observed and filmed by US Navy Chief Photographer D.Newhouse on 2-Jul-1952). perfectly spherical (silver ball e.g. "very bright sphere, much like a large reflective mirrored ball, like an oversized ball bearing" San Jacinto CA USA 1988 ufologie narcap, "shiny silver spheres" Quirindi NSW Australia 10-Aug-1998 ozfiles, "bright and sparkling silver balls, like silver coins of all denominations" letter to upstate NY newspaper of a 24-Oct-1887 sighting). Small white or amber light-balls, from baseball to beachball in size, are reported all over the world, sometimes seen at very close range and by multiple witnesses. During WWII many night-time sightings of "foo-fighters" were described as luminous spheres ~1m (3ft) in size, which would pace aircraft over war zones. a sphere with a protruding "band" / "ring" around the equator e.g. Leslie Michigan, USA 10-Jul-1998 or Livingston, Scotland, UK 1979.
oblate spheroid, i.e. flattened sphere. Often with an equatorial ring ("flange"), "saturn" shape (i.e. like planet Saturn with its rings), e.g. Trindade island, Brazil 1958, Passo Fondo, Brazil 12-May-1976. cylindrical / cigar ("fuselage" i.e. like an airplane without wings, torpedo, missile etc) typically "bright silvery metallic"-looking or white ("like fluorescent tube lamp" or "white hyphen" or "pencil aglow"), and flying in the direction of its long axis. Large cigar-shaped UFOs are often reported to be surrounded by a luminous "foggy haze" and may also have one or more "rings" / "stripes" / "bands" of different color around them, e.g. "a silver cigar with a dark band in the middle". Close-range sighting reports may mention "portholes" or "windows" along their length, often emitting light; see illustrations: Aarhus Denmark 2004, Indian River Yukon, Canada 1996, Denison, Texas USA 1981. Sometimes both ends of the cylinder are abrupt i.e. don't taper off, like "oil barrell" or "coke-can" (e.g. Colares Brazil 1977), othertimes one end is pointed and the UFO is bullet-shaped (e.g. Fukuoka, Japan 1948 - BB #218, Mount Kilimandjaro, Africa 1951). Early reports of a giant cigars, width about 1/6th of their length, include a sighting on 28-Nov-1942 during WWII raid on Turin Italy (src: official British Royal Air Force files), a report by unnamed astronomer "I got a good view of the projectile [...] and estimate that it was at least 90 feet long. The body was torpedo-shaped and shining like metal. No sound could be heard, although the bomb was only 2 kilometers away" (NYTimes Special 13-Aug-1946), and the 8-Jan-1956 at Weddell Sea Antarctica by 4 scientists from Chile estim. 450ft (137m) long and 75ft (22m) in diameter. Cases of smaller cylindrical UFOs include the Coyne, Army Reserve UH-1H helicopter-UFO encounter 1973 and an under-water UFO (a/k/a USO) argentinian merchant ship Naviero, Sep-1968. In 1953, the US Air Force contracted Battelle Institute to perform a study of 3201 UFO sightings recorded between 1947 and 1952; 5.2% were rocket-like (see Project Blue Book Special Report No. 14, page 197, tables A140-A146). NICAP's "UFO Evidence" (1964) Section XII, reports that 8.3% of the UFO sightings recorded between 1942-1963 were cylindrical. More reports: cigars @ ufoevidence, 900+ reports @ NUFORC, uforth. Videos of cylindrical UFOs surrounded by luminous white or straw-colored haze: Krasnodar Russia 1990, Salida CO USA by Tim Edwards 27-Aug-1995, Satipo Peru 29-Jun-2000 by "Forever Rock Band"; with dark "band(s)": Roma Italy 6-May-2004, Sanremo Italy 29-Sep-2009, Ukraine 23-Jun-2008, Tennessee 2009, Milpitas CA USA 13-Mar-2008, Saratoga County NY USA Jun-2010, Gulf Breeze FL USA 1997. See snapshots of cigar UFO videos. Hundreds of well-documented multiple-witness sightings of triangles in recent decades e.g. the landmark Belgium 1989-1990 UFO wave (photo of triangular UFO over Petit-Rechain, Belgium 1990 estim. to be 36m / 120ft per side, ref: NPC Nov-2007 testimony (.PDF) of Belgian Airforce Maj.General, Ret. Brouwer), the triangle flyover RAF Cosford and RAF Shawbury UK in Mar-1993 (ref: nickpope), over St.Petersbug, Russia Feb-1997 (videotaped by 3 separate witnesses, incl. air traffic controllers). Recent cases from North America include the UFO wave at Hudson Valley NY USA in the early 1980s, the "Phoenix Lights" 1997, the Illinois USA 5-Jan-2000 (NIDSCI, ufoevidence, dbakertv), the Peterborough, Ontario Canada 2004 etc. A long wedge-shaped UFO, was seen by crew of commercial airliner flight BA5061 over Manchester in Jan-1995 and investigated as a "near miss" by CAA. A well-known case of a smaller (~3m / 10ft per side) black triangle is the Rendlesham forest Bentwaters/Woodbridge AFB incident in Dec-1980 in Britain. More: triangles @ ufoevidence. Earlier sightings include the sighting by Mr Willemstyn over Bushey Herts 1-Aug-1963 (FSR V11N6), the Pag island Croatia 1967 (sketch), the Memphis TN May-1977, Patapsco State Park, Maryland USA 1978 [to-check: San Juan Capistrano State beach in 1967]. Bluebook's unknowns include a close-range sighting of a formation of three (3) silvery-metallic delta wing shaped craft, reported by two USAF colonels in Jul-1952 BB #1584 (note: date is at the height of the 1952 wave, when UFOs also flew over Washington DC). NUFORC audio files include a report by a US Navy pilot flying recon for the CIA, in a F4 flight back from Japan on 6-Dec-1977, had a black triangular UFO about twice the size of his plane pace him very closely for 30 minutes (src: SDI400 @ 33min). Sightings of triangular UFOs began rising in the late 1960s and became very common in the 1980s. However there have been sightings at least as far back as the 1950s: historical record of triangles, more. Retired Soviet cosmonaut Major General Pavel Popovich relates a mutiple-witness sighting, while flying home from Washington, DC with a delegation of scientists (src: "Out of the Blue" documentary 00:41min): a triangle emitting bright white light, flying parallel and overtaking their plane in 30-40sec. 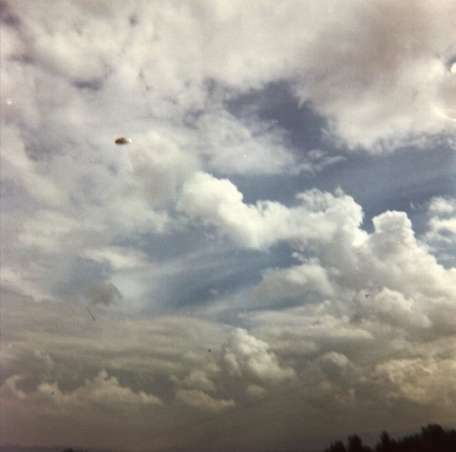 Rhomboid/diamond-shaped UFOs include the "Calvine photos" taken at Pitlochry Perthshire 1990 (case file included in the batch of UK MoD files released in Mar-2009; the actual photos were not released, but Nick Pope -who staffed the UK MoD UFO desk between 1991 and 1994- has said he used to have a blown-up copy of one of these photos on his office wall). Other cases: Big Chimney, West Virginia 1975 (CUFOS), Ardingly 4-Sep-1989, UK MoD drawing (note: near reservoir) and a similar craft was observed in Port Washington, Wisconsin Oct-1998. Similar reports: drawing by Gene Congdon, CA USA 12-Aug-1964 / stories. Night sightings of boomerangs mention several distinctive "lights" on the underside - model, reports. Often described as huge (e.g. estim. ~800m / 0.5mile wide using laser range finder in USS Memphis 1989 case, if authentic), othertimes est. 150-200ft. 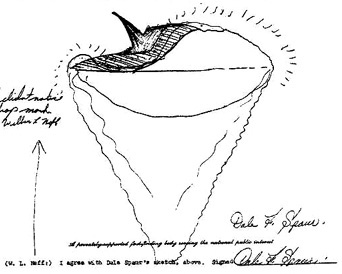 Pilot Kenneth Arnold report in 1947 included one crescent-shaped object. Sightings of boomerangs in USA include the Lubbock USA 1951, the Arizona 1981 (more) and New York and Connecticut 1983. During the famous Hudson Valley 1983-1984 wave of sightings (which prompted astronomer Dr.Hynek, who for 20 years served as the scientific consultant to USAF's UFO Project "Blue Book", to co-author the "Night Siege" book), a boomerang reported on 24-Mar-1983 was said to be large enough to be a "flying city". Overall thousands of sightings, with best known case that of "Phoenix Lights" in 1997 recently confirmed seen by then Arizona Governor Symington (note that some ignorant media pundits mix the early afternoon 18:00-20:00 sightings of "immense V-shaped formation of lights flying over people's heads" with the 22:00 "lights across the horizon", probably military flares). Stories of large boomerangs keep surfacing in different parts of the world, e.g. in April-2007 over Athens Greece, Istanbul Turkey, Calgary Canada, Missuri USA. Smaller boomerangs have been recorded several decades back e.g. Fort Stockton, TX 1972, Ocala, Florida USA 2-May-2005. Note: A possibly related unconfirmed story, which I found particularly fascinating, is the so-called "Moonshaft" artifact, a crescent-shaped black mass allegedly buried in a limestone cave in Slovakia. hexagonal (comprised of 6 equilateral triangles). Note: Assuming eyewitnesses are reasonably accurate in reporting UFO shapes (considering the issues discussed in sections #9 and #19 of this page), the great variety of UFO shapes has been raised (typically by occultists) as argument against the idea that UFOs are "nuts and bolts" physical craft or as reason for disbelieving the reports altogether. However IMHO this is an inadequate basis for discounting the record. I can offer several ideas which could account for the diversity of UFO shapes: 1/ different designs perhaps tied to different purposes (just consider the diversity of vehicles in a busy metropolitan freeway, or the 100s of different designs of aircraft and spacecraft in the past few decades) 2/ variable geometry, e.g. retractable domes (cabrio cars have folding sun-roofs and aircraft like F-111, F-14 and Su-24 allowed variable-sweep wing configuration) and even 3/ taste / aesthetics. Considering the recent trends towards "mass customization" in marketing/manufacturing, as seen in e.g. "chopper" motorcycles, given the technological capability, every craft might be somewhat different, along some main base configurations, which is essentially what we see in UFO reports. Sizes: There is a great variation in size of UFOs. From spheres of 0.3 meter (1ft) or less ("like softball"), up to 800 meters (0.5 mile) or more for the huge "motherships". Saucers, spheres and oval craft ordinarily range 3-30m in diameter, e.g. saucers are typically 6-10m (20-35ft) in diameter. Saturn-like objects (sphere with a "ring" around the equator) are in 2-15m range. Triangles 3m-300m per side. Boomerangs ("V") up to 800m (0.5 mile) across. Conical "coolie hat" disks about 200m (e.g. Costa Rica 1971, Korea 1950) and "dirigibles" about 100m (e.g. Chesapeake Bay 1962). For comparison, a Boeing 747 "Jumbo jet", one of the largest passenger aircraft, has a length of 70m (230ft) and wingspan of 60m (195ft). The US Nimitz-class aircraft carriers are 340 m (1115ft) in length and oil supertankers up to 470 m (1540 ft) in length and 60 m (196 ft) wide. Carrier deploy/recover: spheres and saucers leave and enter large cylinders, dirigibles and cones. Very small spheres and disks (thought to be remotely controlled sensing devices) and round-/discoid-/egg-shaped craft of a few meters in size (thought to be "scout ships" / "planetary excursion vehicles", as they are typically seen on or near the ground, sometimes with occupants) are dispatched from larger craft (thought to be "mother ships") which typically stay at high altitudes. This is comparable to our aircraft carrier paradigm, dispatching various aircraft, helicopters or drones/UAVs. Rotation/Spin: UFOs with a round cross-section (e.g. spheres, disks, ovals, cones, cylinders) are often reported to exhibit a rotary motion. Many diskoid UFOs have luminous "portholes" ("windows", "vents") arranged in a circular band around their circumference. These often give the illusion of rotation, by blinking multi colors in sequence, or a single color but each light will individually pulse brighter periodically ("All the lights were on all the time, but each light would individually pulse bright. The pulse would take about one second to complete one revolution"). Witnesses often describe them as "chase lights" or "lights on a theater marquee". Note: Rotation of "lights" at the rim of saucers is practically always reported to be counter-clockwise i.e. left to right as seen from the side. A few UFOs have been reported to have two rotating sections, which counter-rotated. UFOs are almost never reported to rotate in their entirety, despite the popular myth. Examples: Waterbury CT 1987, America West Airlines Flight 564 May-1995, Newport CA 2009, Puerto Rico 1990, Redlands, CA USA 1968, Blenheim, New Zealand 1959, Bexley, UK 1955. P.Hill (Section III - Illumination) called them "running lights" and thought they are "at least as complicated as those of cars, boats, and aircraft, and perhaps as superficial". Others have suggested that the rotating components of UFOs may be for gyroscopic stabilisation. However I suspect it is integral to the propulsion system and to that effect I've been particularly intrigued by the parallels with recent scientific literature on gravity effects of rotating superconductors and the subject of field effects caused by moving matter known as "Gravitomagnetism". Some diskoid UFOs (e.g. saucers, saturns etc) have been reported to have a rotating outer rim, which is described as spinning (or "vibrating") independently from the central part or cupola, which remains stationary. Wobble: when hovering or moving slowly, some round UFOs (e.g. saucers, saturns) exhibit a "wobble" in a sinusoidal path (typically about 30°, ±15° from centerline), an undulating "rocking" motion, like a gyroscope or a top (other expressions used by witnesses: "like a boat at anchor on water" or "tipping right and left"), similar to that of a spinning coin as it is winding down and closely approaching a flat surface. Propulsion: Several UFO researchers, including Plantier, H.Oberth, L.Cramp, J.Harder, J.McCampbell, P.Hill, and C.Poher, via a process of elimination of alternatives, speculated on UFO propulsion by accepting a hypothetical (or yet unknown to public scientific research) gravity-like "force field", which can be repulsive as well as attractive (i.e. artificial gravity fields, or what is popularly referred to as "anti-gravity"). Indeed, witness reports describe that these fields bend and break tree branches, bump or slow automobiles spinning them out of control or tipping them over, stop people by force or knock them down. There is no jet propulsion, there is no ejection of propellant of any kind. UFOs do not create any significant downdraft of air (unlike a helicopter or VTOL a/c) when they hover. UFOs also do not create any significant air-disturbance (turbulence and noise) when they move. Close range eye-witnesses will typically use terms like "floated" or "glided" or "drifted" to describe how a UFO moved smoothly and swiftly through the air. Apparently UFOs use the atmosphere neither for support nor for locomotion (unlike balloons, airplanes, helicopters, birds etc). UFOs don't use aerodynamic lift, the middle word "flying" in the U.F.O. acronym is a misnomer. UFOs don't "fly", they are vectored along trajectories. NASA aeronautical engineer Paul R. Hill in his book "Unconventional Flying Objects: A Scientific Analysis" (written in the 1970s, published post-humously 1995) explains how UFOs may utilise acceleration-type (i.e. gravity-like) force fields in several ways: externally for propulsion and airflow-control (shockwave suppression and drag reduction) and inside the vehicle for acceleration neutralization during maneuvers (so UFO occupants can withstand the tremendous accelerations, which would certainly kill a human pilot). Of the first two field types, the UFO propulsive force field (PFF) may be thought as being long-range, narrow and focused. Whereas the UFO airflow-control force field (ACFF) may be thought as short-range, continuous, and having components which are uniformly distributed with respect to direction. In his book Hill -who was a famous aerodynamicist in his day- provides calculations and possible arrangement of force field generators within spherical and elliptical UFOs, which would produce the necessary effects, including the ability of UFOs to travel supersonically without generating a sonic boom. Manipulation of the surrounding air/water by the ACFF would, even at supersonic speeds, result in a constant-pressure, constant-density flow around the UFO, in which the UFO is surrounded by a subsonic flow-pattern of streamlines, and subsonic velocity ratios (hence no shockwave i.e. sonic boom). This minimizes friction and heating issues. An additional benefit of the ACFF is that drops of rain, dust, insects, or other objects would follow streamline paths around the UFO rather than impact it. Effectively, the ACFF creates a "protective shield" around the UFO, much like an incandescent light bulb: the UFO is the filament and the bulb is the air-control field around it, which protects the UFO, keeps the surrounding medium (air/water) from coming in touch with the UFO. (Todo: confirming testimonies 1/ rain-drops 2/ APRO case of farmer in Miller County, Missouri 14-Feb-1967, who threw rocks at a UFO and they bounced off an invisible barrier 3/ projectiles, verify stories of firing anti-aircraft gun at UFOs in WWII e.g. "you could see by the tracer rounds that the stream of fire was arcing around the object, not ricocheting, but going around it and straightening back out" 4/ R.Haines' cases of PFC Francis P. Wall Korea 1951 and hunter). Speculation: On the right column of this webpage, I offer my interpretation of the Lynn, MA USA 2006 and the Albiosc Tavernes France 1974 photographic cases, along the ideas on UFO propulsion, radiation and illumination outlined in this webpage. I suggest that the "aura-like" glow of the air (i.e. "plasma sheath") around many UFOs is due to the ionization of surrounding air by the EM radiation accompanying the UFO "airflow-control" force field (ACFF) used for shockwave suppression and drag reduction. The ACFF apparently creates an envelope of lower atmospheric density (vacuum) around the UFO, by pushing the surrounding medium (air/water) away from the skin of the UFO. UFOs seem to switch off their ACFF when they hover near the ground or land, which eliminates the "plasma sheath" and allows details of the UFO to be seen. Hill (p.214-6) ties the seemingly absurd report of a UFO hovering over a pond and causing its surface to freeze (Vashon Island, WA USA 1968) with the refrigerator-like (adiabatic expansion to low temperature of air going into the zone) effect of the UFO ACFF, which apparently was left active in this case. Note: There is some evidence which suggests that the UFO gravity-like force field has a cyclic component, i.e. periodically attracts and repells matter. Also, in several cases of hovering round UFOs (discoid, spherical and egg shaped) the gravity-like force field seems to prevail within a cylindrical zone having about the same diameter as the UFO and extending from it down to the ground. This force field acts upon objects underneath the UFO, and also seems to be imparting them a rotation (a torque or turning force) as suggested by the spinning and swirling of loose materials (plants, sand etc) under many round UFOs. Very oddly, there have been reports of water (and snowflakes) "rising" towards UFOs, as they hover or move slowly over the surface of lakes and seas. Warning: UFOs' propellantless propulsion and associated phenomena seem to defy our Physics theories. Both Classical Mechanics (Newton's gravity) and General Relativity (Einstein's theory of gravitation), require the existence of "negative mass" (or energy) for antigravity to be possible, however the Standard Model of particle physics does not permit negative mass. To overcome these objections, other UFO researchers (e.g. physicists Friedman, Meesen, Petit, Warmkessel), attempt to explain UFO propulsion based solely on the currently established Physics theories; in particular on "MagnetoHydroDynamics" (MHD), i.e. ionize the ambient air into plasma and then work with magnetic fields. Test vehicles have been built around MHD principles, including the EM submarine model tested by Dr S.Way of UCSB in 1965, the submarine Yamato1 of Japan in 1992 or the recently proposed "Wingless Electromagnetic Air Vehicle" - WEAV by Dr S.Roy of the University of Florida in 2008. Although UFOs would become more acceptable, if more of the UFO pattern could be explained in terms of today's scientific principles, IMHO an MHD-type modus operandi simply doesn't conform to the UFO evidence (e.g. it doesn't account for the direct gravity effects). Non-mainstream Physics: All is not lost yet, as mentioned in the "Rotation/Spin" section above, there is new but yet unconfirmed scientific research in the field of gravity effects of rotating superconductors and "Gravitomagnetism". Anomalous gravity effects have been reported e.g. in Mar-2006 Austrian physicist M.Tajmar et al in an experiment funded by ESA (European Space Agency), reported generation of a toroidal (tangential, azimuthal) gravitational field in a rotating accelerated (time dependent angular velocity) superconducting Niobium ring. (src: ESA page on Tajmar's experiment). Theoretical frameworks include work by Sakharov, Haisch, Rueda and Puthoff (Zero-Point-Field and polarizable vacuum) and by Burkhard Heim (newscientist). More on this issue in my UFO Physics page. Radiation: When airborne, UFOs emit invisible electromagnetic (EM) wave energy with ionizing capability. There is some evidence and theory (Hill, Section X and XIX) indicating that the EM radiation is about coincident with the UFO's "gravity-like" force fields, i.e. gravity-like waves (used for propulsion and airflow control) and ionizing EM waves go together, the latter being some form of support for the generation of force field waves, or simply a side-effect (i.e. propulsive waves may have an electromagnetic component). Hill estimated UFO primary radiation to be in a range between the bottom of X-ray band and the lower end of Gamma-ray band. (Wikipedia: Electromagnetic spectrum and Ionizing radiation) These X-rays or mild gamma-rays are quite adequate to create the universally seen "ion sheath" around UFOs. Conversely, the existence of the ionized air around UFOs lends weight to the concept of high-intensity EM radiation from the UFO. X-rays would also penetrate a few inches of soil, giving up their energy to plant-root depths. Soil being a thermal insulator, the heat would escape slowly and the temperature would build up with time below a low-hovering UFO. Much ground heating data is from saucer-type UFOs, which are known to focus their force fields and accompanying ionizing radiation downward with considerable accuracy, because of the observed saucer "ion cones" (refer to the photographic cases on the right column of this webpage: luminous "icecream cone" under the disk in the French Gendarmerie and the four "white beams of light" in Albiosc France 1974) and "saucer ring" on ground data. Mild Gamma-rays are suspected for symptoms similar to radiation sickness in witnesses who have closely approached UFOs. However, lasting radioactivity, which would indicate the presence of particle radiation, has not been found at landing sites. It should be noted that radiation has been suspected to be associated with UFO sightings since the early 1950s. The classic 1955 book "Report on UFOs" by Edward J. Ruppelt, who served as head of the United States Air Force's UFO Project "Blue Book" between 1951-1953 and later research engineer at Northrop Aircraft Company, mentions grass roots charring and skinburn of a Florida scoutmaster in 1952 in Chap.13 and the issue of UFO radiation in Ch. 15. Examples of UFO radiation cases: 600keV in test soil of Lake Anten, Sweden 1970 and the Michalak, Falcon Lake Canada 1967 (ufologie, ufoevidence). Physiological effects on human witnesses who came close to a UFO, include a sense of "static" (hair stood on end) or prickling sensation and in some cases a heating / burning sensation, vibration (more on this on section #17 on UFO sounds) and temporary paralysis (attributed to shock/fear, but I think more study is needed since animals are reportedly also affected). After-effects of close encounters may include sunburned-like skin and eye irritation (e.g. conjunctivitis), extreme dryness of the nasal area and of the throat, nausea, vomiting, headaches, general weakness. There have been a few cases of people and animals who stood directly under a UFO who experienced symptoms similar to radiation-sickness. People who have stared at glowing UFOs at close range have suffered "welder burn"-type eye damage, temporary loss of vision and even lasting eye damage (note: UV?). Occasionally odors have been reported, described as "ozone-like", "foul stench", "pungent", "sulphury stink" etc. Accidents have occured. Further reading: "A catalog of UFO-related human physiological effects" (1996) by John Schuessler and UFO cases involving injury/death by Geoff Dittman. Interference: EM effects observed include interruption of electrical circuitry and radio communications, magnetic and gyro compasses gyrate and wobble, batteries are burned out. Car gasoline engines stop (but oddly diesel are apparently unaffected). More: 56 aircraft pilot UFO sightings involving EM-effects, strong magnetic field. Absense of heat near a UFO only mild sensation of warmth, so not much infra-red radiation. The surfaces of the UFO are not very hot, nothing is at a red heat. A "corona", i.e. a luminous plasma (ionized air) is produced around specific areas of the UFO, probably created by the intense EM radiation (radiant ionization). Illumination / Colors, luminosity and lights: (note: this is a complex subject and much of what follows is my speculation and conjecture) Though a few UFOs appear totally dark and unlit (no light in the visible spectrum), the most common aspect of UFO sightings made at night or twilight, is that the UFO appeared to be a source of light, rather than just reflect light from elsewhere (in fact, about 2/3rds of all UFO reports is of distant lights moving in the night sky). As suggested in the previous sections on UFO Radiation and Propulsion and the featured photographic cases on the right column, many of the UFO "lights" are thought to be luminous ionization of air, resulting from energetic EM radiation emitted by the UFOs in relation with the UFO gravity-like force fields (used for airflow-control, propulsion etc). The overall shape of UFO luminosity depends on the shape of the UFO and its current operating condition and maneuver, so a UFO's outline as seen by external observer can change (e.g. a disk at night may appear as a luminous icecream-cone, teardrop, oval or sphere). UFO glow can vary from faint ("like phosphorescence"), to soft ("like a neon light"), to intense ("like huge car headlights"), to extremely bright ("like welder's arc"). full body luminosity / halos (e.g. "an eerie glow surrounded the UFO like an aura", "each UFO was engulfed by a sphere of light") which may change colors (predominantly orange/yellow, but sometimes white, red, green, blue) and brightness in a "flickering" / "pulsating" manner. Full body luminosity is usually observed on UFOs in flight. In rare cases it is observed in a landed or hovering UFO, however, in those cases, the object usually almost immediately engages in flight. Hill (p.316) thought "there seems to be considerable leakage or random radiation, because the UFO is sometimes surrounded with an ion zone", however I would offer the idea that the "UFO ion sheath" may be a boundary layer effect due to the -hypothetical- "airflow-control force field" a/k/a ACFF, a short-range, continuous, radial field, having components which are uniformly distributed with respect to direction; I discuss this in the section on Propulsion and Radiation and the featured photographic examples of Albiosc France 1974 and Lynn, MA USA 2006. Interpreting the "UFO sphere of light" based on my idea: The ACFF (similarly to a glass around the filament of an incandescent light bulb) pushes the air/water away from the surface of the UFO in a radial pattern, creating a spherical shell of rarified air (near vacuum) close to the surface of the UFO. The sphere of luminous ionized air (plasma) at some distance around the UFO is a boundary layer effect, at distance r0 and of thickness Dr, the latter being the zone where the density of rarified air is "just right" to be ionized by the EM radiation accompanying the ACFF. patchy body light light is emitted from certain areas of the UFO's geometry, e.g. several "lights" on their underside and sides. Saucer-shaped UFOs often emit light from their underside or rim. Triangles often have 3 lights on their underside, one at each corner, which point downwards. [todo: PFF]. Examples: Green Bay Wisconsin USA Jan-2007, Weyauwega, WI USA, Feb-2003, pilots of Chicago airlines DC3 Mar-1950. Certain beams seem to be used for inspection or transportation (MUFON-CES Conf 1978, Coyne helicopter case OH USA Oct-1973). Some may be weapons, having as a purpose the projection of heat, the disruption of electric and electronic equipment, and even the temporary paralysis of individuals. Finally some could just be powerful beaming spotlights, to light up the terrain. "running lights": In addition to the patchy body lights and the sheath of illumination surrounding the UFO, some UFOs are also reported to have lights on them. They are variably described as "portholes", "windows" or "vents" etc, which may output steady light or blink multi-colored in a sequence, like a theater marquee or disco flashing lights (e.g. Waterbury CT 1987 photo - refer to section #5 Rotation/Spin). Diskoid UFOs may have such lights arranged in a band/ring around their circumference, spheres in a equatorial ring, cigars may have "brightly lit windows" along their length. Hill terms them "running lights", and thinks they are "at least as complicated as those of cars, boats, and aircraft, and perhaps as superficial", however IMO they also could be related to the UFO's propulsion. Some UFOs have strobe-like flashing "beacons" on their top or bottom. ejected luminosity is sometimes reported, as shown in photos (e.g. Robert Campbell 2-Aug-1965), night-time videos (e.g. Long Beach, CA Police Department helicopter FLIR 25-Dec-2004 youtube), and testimonies (e.g. "throw off glowing particles, like molten metal" -- Col. Halt, case Rendlesham forest Dec-1980). Material remains luminous for some time after falling away from the object. If this material is a plasma then a) it is heavier than air, and b) it is cohesive enough to survive a fall through the air and retain its luminosity. In some cases, it might also be a luminous liquid (todo: Delphos Kansas USA, 1971) or molten metal (todo: Bob White artifact 1985). "flashes" of light: UFO reports may mention intermittent flashes ("odd strobe-light effect"), occasionally very bright and noticable even in broad daylight e.g. "like mirror reflecting sunlight". My hypothesis is that it is probably when brilliant plasma surrounding the UFO emits light directly or via reflection off the skin of the UFO. Let's first explore the "sheath of illumination": Observing a UFO from some distance at night or twilight, people very often report that the UFO appeared to be a source of light, rather than just reflect light from elsewhere. Closer observations have revealed that the glow comes from the air surrounding the UFO ("like an aura") and not from the UFO itself, except by reflection from the UFO's surface. The night-time neon-like, solid color luminosity emanates from an envelope of air around the UFO, like a halo, rather than directly from the UFO. This halo tends to obscure the UFO, making the edges indistinguishable (the "cottonball effect"). In saucers and saturns the halo concentrates near the "ring" rim, more intensely below than above it. The shape of UFO luminosity depends on its current maneuver, e.g. saucers often have an ice cream cone halo underneath. The big cylindrical mother ships sometimes have great white cloud. While sometimes described as "flames" or "exhaust", very close observations have shown that this glow does not have a high temperature, and it probably represents "cold plasma", i.e. an ionization of the local atmosphere, similar to what occurs inside a neon light. This solid color luminosity comes in golden orange, amber, yellow, red, green (like copper flame), blue-green, blue, bluish-purple, blue-violet, brilliant white, singly or in combinations. Of all the visible colors, red and orange/yellow correspond to the least energy. They are also the two most common colors associated with UFO "low-power" operation (when the UFO is hovering or moving relatively slowly). Blue, green, brilliant white and blue-white are common colors when UFOs move fast. What could be the reason for the many distinct colors? In the previous section on UFO Radiation, I suggested that UFOs radiate invisible EM wave energy with ionizing capability. According to Hill, the UFO radiation might very well have distinctive frequency components and energy levels, depending on the type of UFO and its operating condition, thus exciting different spectral peaks and colors (ref: ionization @ wikipedia). The UFO colors would be quite different on any other planet, depending on the composition of its atmosphere. To describe UFO brightness at night, eyewitnesses might use terms like "phosphorescence" or "aura" or "glare" or "surrounded by a shimmer", but when UFO brightness is stronger people may use words like "dazzling", "blinding", "bright as welder's torch", "magnesium flare" or "it lit up the entire landscape, you could read a newspaper" etc. When UFOs are observed in daylight, people use terms like "shimmering", "glowing haze". Daylight sighting descriptions like "imagine the brightest, shiniest metal" or "like mirror in the sun" may be due to brilliant plasma around the UFO reflecting off the skin of the UFO. Brightness, i.e. light intensity, is proportional to the number of photons passing a given area per unit of time. The UFO ionization energy has two components: 1/ energy level (ref: electron Volts @ wikipedia) and 2/ amount. The former influences the colors of the UFO plasma sheath, whereas the latter, i.e. the amount of ionizing energy per unit area per second that a UFO emits, influences its brightness. So, the indefinite profile and the "wavy, like heat haze" shimmering effect often reported for UFOs are probably the result of the ionized atmospheric gas (a.k.a. "plasma") surrounding the craft, which lights up the surrounding air like a neon sign. Plasmas in addition to radiating light, also absorb light at the same frequencies. Light from the edges of the craft must pass through a greater region of plasma to reach the eye or camera. If the plasma is particularly dense, the light is fully absorbed by the plasma and randomly re-radiated or scattered. As a result, the edges of the craft are indefinite, appearing fuzzy and luminous, or the "cotton ball" effect. The more central region, however, has a shorter path length to the eye, and may thus be visible through the plasma, though still distorted. Darkened regions could conceivably be the result of plasma absorption of light in the visible spectrum, with re-radiation primarily in the non-visible, such as ultraviolet and infrared, but this is more speculative. In daylight: UFOs in the air range from a dull aluminum with just an aura of dark orange, to bright "metallic" polished silver / chrome / "like mirror in the sun" (when brilliant plasma reflects off the UFO's surface). Flat-bottomed disks are often darker underneath, in a central circular area or in an annular ring near the rim. Maneuvers: UFOs are characterized by high speed, controlled maneuvers, extreme mobility, swift and abrupt change of direction. UFO movements are not necessarily continuous and smooth like those of an airplane, but may be abrupt and rapid, with sudden changes of direction and speed, such as reversals (180° turns) and right-angle turns (e.g. Air Intelligence report of USAF pilots Maj Ballard and Lt Rogers 10-Sep-1951) without perceptible slowing down. Hovering at any altitude is common. UFOs hover close to the ground for long times instead of landing. Violent and erratic high speed maneuvers are the most distinctive characteristic of UFOs, which makes the eye-witnesses think this is something beyond their normal experience. Quite often, UFOs move in steps: witnesses have used terms like "in a jerky fashion", "in spurts, shooting forward and stopping", "like a squid, forward and stopping, again forward and stopping". 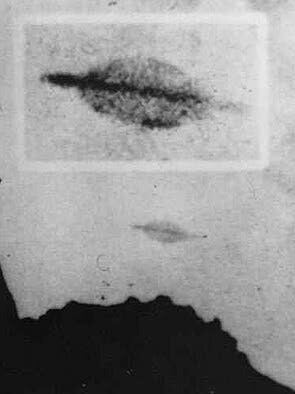 Other witness descriptions include: "undulating, like bat" (Trindade, Brazil), "weaved like the tail of a Chinese kite" or "fluttered like they were speed boats on very rough water... they flew like when you take a saucer and throw it across the water, like a saucer skipping on water" (Arnold 1947). ascend or descend in a spiral / "corkscrew" (e.g. video 1991 @ Las Vegas). When they want to fly away fast, tilt (tip) and fly with the plane of the disk directed forward. Such departures are of high-angle (typically 45°), high acceleration ("like a bullet") ballistic-arc trajectories. Note: Some of these flight characteristics, like the "UFO-rock" and "coin wobble" have been thoroughly researched by Paul Hill, who personally tested them, after he had built a custom pressurized-air-propelled flying platform in the 1950s (photos included in his book). According to Hill and Oberth, diskoid UFOs often fly in a manner as if their drive is perpendicular to the plane of the disk, i.e. tilt to perform maneuvers: they sit level to hover, tilt forward to move forward, tilt backward to stop, bank to turn. A curious phenomenon has been 'ground-hugging' / 'terrain following' (following the contour of the earth, maintaining a constant distance from ground). Landing Traces: Sometimes UFOs simply hover low above ground, producing swirled-down grass rings / nest-like imprints called "saucer nests" and annular rings of heat-damaged soil with chemical and physical alterations. Examples of "saucer nests" include Langenburg Saskatchewan, Canada, 1974 and Tully Australia 1966 cases. Othertimes UFOs do a belly-landing, e.g. the Trans en Provence, France 1981. There were many UFO landing cases in the 1950s to 1970s, where UFOs extended retractable landing gear of some sort, usually legs with footpads. 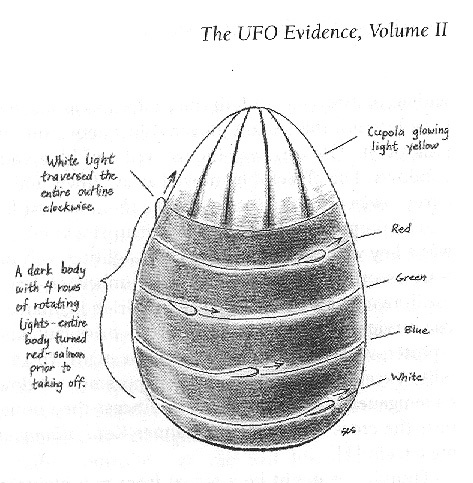 Typically 18-30ft saucers have 3 legs, whereas the 20ft egg-shaped UFOs have 4 to 6 legs. It was those landing gear which have left marks (imprints) on the ground, amenable to soil compression analysis, from which it was possible to estimate the probable weight and density of some UFOs. smaller hemispherical (= dome, helmet, mushroom) / spherical / conical object, from 1.2-4m (4ft-12ft) in diameter, sometimes with "vents" or "extensions". They rarely touch the ground but remain stationary 1-5ft above ground surface. Generally leave behind circular areas which are depressed, burnt or dehydrated. small egg-shaped object 2-2.5m (6-8ft) long [drawing or see photo from Dec-2006 MA, USA case], which hovers with the long axis vertical. A spherical object about 15 ft in diameter. elongated cylinder without external appendages, comparable in size to the body of a jet fighter, that flies in the direction of its axis. oval/egg-Shaped objects, 5-6m (16-20ft) in length [e.g. drawing of Zamora, Socorro NM USA 1964] with visible landing legs, generally four, on occasion six. These make ground contact, leaving burnt areas, imprints, some tree damage. Small humanoid beings are often reported. 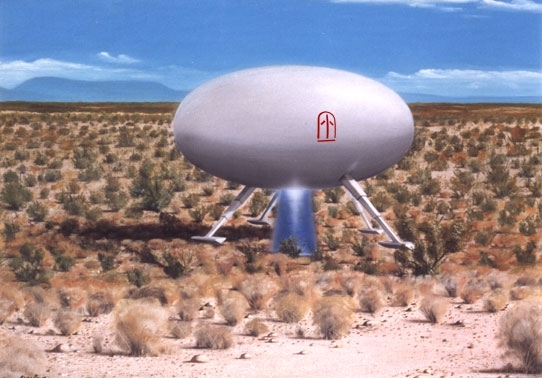 typical flying saucer, 3m - 12m avg 9m (10ft - 40ft, avg 30ft) in diameter. They land, leaving burnt or depressed areas with an irregular configuration. Larger disks typically have retractable landing gear, three legs in equilateral triangle. E.g. Hill's book starts with the case of the landing of a 12 meter disk at Aluche, Spain on 6-Feb-1966, which 15x30cm footpads with X-print left deep 12cm imprints, arranged in a equilateral triangle of 6m per side (imprint-to-imprint). Weight: According to Ted Phillips / CPTR, UFOs are quite massive: soil compression testing of imprints of 18-30ft saucers and 20ft oval/egg-shaped UFOs, indicated a range between 8-10 tons for saucers and 14-18 tons for ovals. In the case of Quarouble France on 10-Sep-1954, an oval UFO 6 meters axial, 3 meters cross diameter landed on railroad tracks leaving deep indentations on wooden crossties, and was estimated at 30 tons. This is 965kg/m3 (note: 1000kg/m3 is the density of water), which is like modern nuclear submarines (which might explain the amphibious capabilities of many UFOs), but is much more than jet airplanes. Wakes/Trails: Generally UFOs don't create visible trails in daylight. Large UFOs like dirigibles and cylinders may have plume-like wakes when accelerating rapidly or moving at high speeds. They can move slowly at 100 mph without generating a wake. These wakes are gray to straw-colored in daylight, red or green flame-colored at night. What is described as "flames" or "exhaust" or "sparks" at night-time is probably a cold zone of ionized air (plasma), whose plume shape is controlled by the ionization and ion-relaxation processes. Daylight trails are possibly vapor condensation due to the ACFF (see my take on it at lits). Speed: Speeds of about Mach 5 at relatively low altitude (10Km/30Kft). Several multi-radar cases of ~5,000mph [1.4 mile/sec, 8100Km/hr, 2.2 Km/sec, Mach 6.5]. A few cases of up to 9,000mph [2.5 miles/sec, 14500Km/hr, 4 Kilometer/sec, Mach 12] in the Earth's atmosphere. Then there is the case of Aug-1956 Bentwaters England, when military radar recorded one case of 12,000mph (note: official aviation records @ wikipedia shows e.g. SR-71 max speed 2,200mph). UFOs are also able to hover motionless in the sky. Acceleration: Can accomplish 100g (ref: G-force @ Wikipedia) Hill points out that the dazzling maneuver performance of UFO scout ships seems to result from their being over-designed for the investigation of planet Earth. If the UFO mission is planetary exploration, the high-g capability they demonstrate would enable them to explore giant planets with gravity on the order of 100 times Earth gravity. Exploring Earth is UFO PLAY. Sound: Researchers classify several groups of UFO sounds: 1/ low pitch (hum, buzz "like swarm of bees", that "can be felt, as well as heard"), 2/ high-pitch (whine, hissing, shrill whir, high pitched hum/drill), 3/ highest pitch (shrieking, piercing whistle) or "signals" (shrill beeping, modulated whistle), 4/ rush of air (release of air, swishing, fluttering), but rarely also 5/ violent ("thundering roar", bang, loud explosion) and 6/ "electrical" or crackling sound ("noise like a mosquito zapper"). Sound rises in both pitch and intensity seconds before and during take-off. Steady motion with either a light swish-of-air sound or running absolutely silent. Operation is almost completely silent compared to conventional jets and rocket engines. An odd effect is the "cone of silence", where witnesses report that all other background sounds from the environment (birds, insects etc) cease and everything seems still. Other times witnesses report an intense and penetrating humming sound. Hill's book explores the subject of UFO sounds in detail, offering various ideas: one is that the UFO's gravity-like propulsive force field has a cyclic component. As a result of direct force field action, the cyclic component in the UFO force field induces vibrations, i.e. shakes nearby air and objects (e.g. road signs, water on the lake surface and of course people's bodies) at the hum frequency. Witnesses have used terms like "vibrating" or "rattling", "feeling like a jelly on a plate, everything was trembling" (e.g. Rosedale, Victoria, Australia 1980) etc. This would explain why the UFO hum "can be heard as well as felt, on your skin and your insides and seems to permeate everything", as is reported by witnesses who have come close to UFOs. Witnesses have compared the UFO "hum" frequency to a "refrigerator" or "base speaker with unplugged amplifier" or "transformer" or "el. generator" (note: 50-60 Hz), another witness estimated it ~40 Hertz and another said the sound rose an octave (i.e. frequency doubled) as the UFO took off. If the column of air below the UFO were not restrained at areas such as the air-UFO interface, it would be "pumped" up and down, in rapid succession. Hill's idea is that the UFO "hum" sound is created at the interface between the air and any deflection resistant surface (the ground or the UFO itself, both being rigid and massive) by to "pumping" movement of the column of air under a UFO. Sound waves are created at the interface between the lower surface of the UFO and the atmosphere, and travel out through the air like any other sound. A different approach to the source of UFO hum/whine sounds was taken by McCampbell. He contended that UFO hum could be due to the pulsed EM energy directly stimulating the human auditory nerve, i.e. not pressure of sound waves to the eardrum [more in UFO sounds by J.McCampbell], but IMHO the former scenario (force field with cyclic component) seems to better fit the reports. Also, the idea that UFOs emit microwaves seems unlikely, because if they did, tracking UFOs would be easy, considering how many microwave receivers are in use [todo: ELINT, RB47, Hessdalen]. The "rush of air", "like deflating balloon", "release of air as if it is coming from a high pressure nozzle" (e.g. Navy petty officer 1971, Vaucluse Beach Australia Jul-1965) reported before UFO takeoff and landing, are IMHO possibly generated by the airflow-control field (ACFF) being switched off/on. Also "swishing" ("like helicopter on idle with blades swishing") sounds. Rarely, violent explosive noise / "thundering, deafening roar" / shock waves appear to be generated right before take-off or rapid acceleration. Hill thought it might be due to low-altitude resonance of the force field and air column under the UFO, which ceases with an increase in altitude (i.e., the result of the rare occasion when the cyclic "hum" frequency coincides with the natural frequency of the air column under the UFO). I am considering the possibility of ACFF, as air adjunct to UFO is pushed away to create near-vacuum. (ref: cases of patrolman @ San Joaquin CA, Zamora @ Socorro NM USA, Rosedale Victoria AUS 30-Sep-1980). No shock waves or 'sonic boom' are produced even when the UFOs are traveling several times the speed of sound. One theory for this is the control of airflow by the UFO's acceleration-type force field, resulting in a constant-pressure, compression-free zone without shockwave in which the vehicle is surrounded by a subsonic flow-pattern of streamlines and subsonic velocity ratios. In his book Hill -who was a famous aerodynamicist in his day- provides calculations and possible arrangement of force field generators within spherical and elliptical UFOs, which would produce the necessary effects. Jitter: at low speed, UFO motion seems jittery. Even in flight, at times, UFOs seem to "vibrate" heavily (e.g. 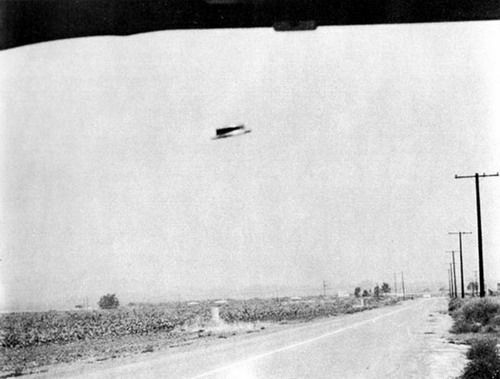 in the case of US Navy planes encountering 2 huge "coolie-hat" discoid UFOs over Korea in Sep-1950, the witness described a "jittering, fibrillating motion"). This could be an optical effect rather than a real jitter (note: this seems to be different that the "wavy, like heat-haze" optical distortion effect in daylight, due to the surrounding plasma). Witnesses also report that the skin, the texture of the UFO seems to "ripple", "wobbly like jelly". Many night-time UFO photos once developed show just a mesh of colorful "squiggly lines of light", e.g. stills from the famous "ambersand UFO" filmed in New Zealand Dec-1978, Dr Bruce Cornet NY USA photos, Mrs Dorothy Izatt of Vancouver, CA who back in the 1970s captured on Super-8 home-movie tape on 1/18sec single-frames without bleed-over to the next frames: pic1, pic2, pic3, those taken by reporter Bill Jackson and local law enforcement in Dulce, New Mexico USA during a cattle mute investigation in 1976 using Lentar lens and highspeed film from Kodak, night-time photos taken in the Smoky Mountains National Park in Feb-2008 etc. 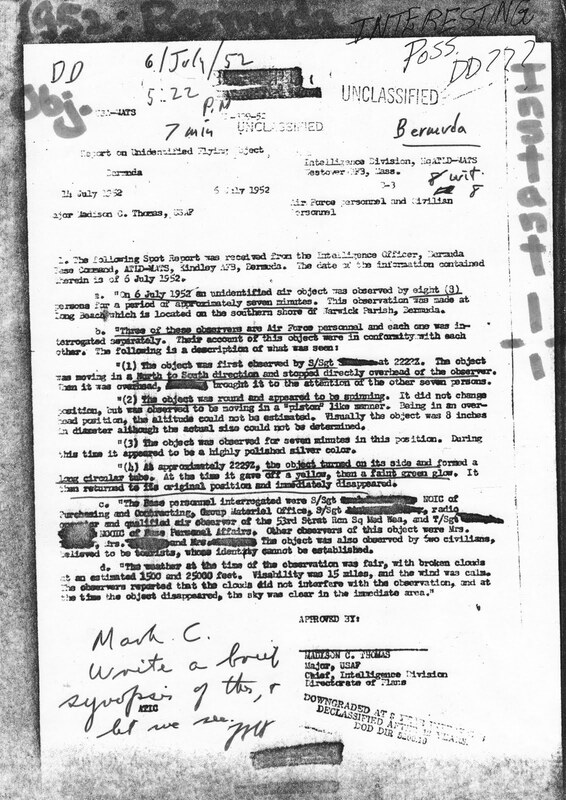 Oftentimes UFOs instantaneously vanish, "blink out": Dr Hynek's files include a document from USAF Project Blue Book which tells of a July 1952 incident wherein three military observers, in the company of five civilians, saw a round rotating object move in and hover directly overhead of the group for several minutes, then "immediately disappear". Capt. Ruppelt, head of USAF Project Bluebook, recounts a UFO sighting by a F-86 pilot on 29-Jan-1953 in Chapter 17 of his 1955 book "The Report on Unidentified Flying Objects" "He [the military pilot] used the old standard description for a disappearing UFO: "It was just like someone turning off a light - it's there, then it's gone." David Biedny, co-host of the Paracast podcast, and his brother, describe in TPC060328 their family's UFO sighting as teenagers in Caracas Venezuela in Jul-1974 "watching along with 100s of people, a giant matte black 'cigar' moving up there in the sky, stopping, three 'lights'/disks coming out from a brightly lit area underneath the 'cigar' and position themselves in a triangular formation around the cigar, then the whole lot vanishing instantaneously" which made newspaper headlines the next day - related: APRO's Lorenzens went to Venezuela in Aug-74, a UFO wave commenced right after the July earthquake and lasted well into August. Elsewhere UFOs are reported to "instantly emerge" e.g. "when it first appeared, it seemed to be breaking through the atmosphere, splitting the blue sky open in order to emerge" Cpt Shultz, pilot of L1011 over Lake Michigan 4-Jul-1981 - check "Pilot UFO sightings" in my UFO documentaries webpage. Sometimes, UFOs slowly (in 10-20sec) "fade" and vanish while in plain sight (example #1: huge est. 800ft disk with fuzzy red outline seen from the side, as it started to tilt, it "became transparent and it disappeared" J.C. Duboc, captain Air France flight 3532 from Nice to London on 28-Jan-1994 -- see Duboc testimony @ NPC Nov-2007 ; example #2: "It was shaped like a huge disk with a flat side facing us. At arm's length the object would have been a yard in diameter. It began to slowly flip over, backwards. As it flipped over, the thin edge of the disk was completely transparent -- we could see stars through it. As it flipped over to its other side, it was opaque again and was bright red like a huge neon sign" by Patricia Hoyt near Los Alamos, NM 1983), or change shape (e.g. BBC video interview of pilots of BOAC Stratocruiser, near Seven Islands, Quebec 29-Jun-1954). Many night-time cases report UFOs changing in angular diameter, e.g. "winked out, from the outer edges inward", "seemed to implode, it shrank, and at a higher level it reappeared again" (4 witnesses of the Allagash case) or LtCol USAF C.Halt microtape "looks like the pupil of an eye winking at you" or "seem to breathe" (expand/contract) or "blink out" both visually and on radar (e.g. case of RB47 from Prof.McDonald audio taped conversations with pilot). Also cases where UFOs can be seen visually from one vantage point, but not another e.g. cases of NM USA state police officer Gabe Valdez, or military witness "Erikson" (Hastings, p358). Finally, there are reports of light "bending" in front of a UFO (e.g. cases of Burkes flat car headlight beams 4-Apr-1966 and Norwood Searchlight Incident 19-Aug-1949). what is reported as "jitter" or UFO surface "ripples" or "wobbles"
the apparent change in UFOs' angular diameter or "shape-shifting"
might all be aspects of the same phenomenon, i.e. the effect of UFOs' fields on EM waves, such as light. Since it is speculated that UFOs use gravity-like force field technology and we know that Gravity bends light, I would offer the idea that UFO "invisibility" is due to some sort of "gravitational lensing"-type phenomenon (crazy as it may sound). FWIW Paul Bennewitz, a UFO researcher & engineer/businessman in New Mexico USA, thought that "UFOs have the ability to cloak -go invisible- by a field that causes the light waves to bend around the object and that one sees the sky behind them" (src: PB interview by Jim McCampbell, published 1984) Note: Bennewitz was the target of a USAF disinfo campaign; was fed info which shortly afterwards would fuel the "underground alien bases" conspiracy lore of the 1980s, and was hospitalized with mental problems. 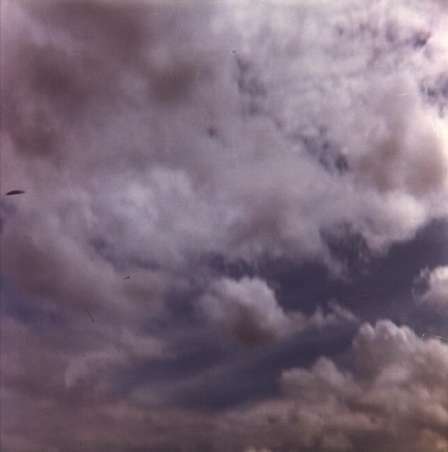 Optical camouflage / Cloaking: On Sunday 1-Jun-1997 11:15am, a sunny day and in broad daylight, two private pilots flying in a light plane over Rainford - Saint Helens UK, were startled to see a very large (est. 150-200ft) sharply defined triangular "shadow" overtaking their plane, but were unable to visually see anything in the air around them (src: Malcolm Smith, inv. David Cayton "UFOs the Hard Evidence Vol.1" video) One can read cloaking device can shield macroscopic objects in visible light @ nature.com 15-Dec-2010, Invisibility cloak @ BBC 11-Aug-2008 "material that can bend light around 3D objects making them disappear" work at UC Berkeley, demonstration of a working "invisibility cloak" by scientists at Duke University's Pratt School of Engineering) or watch the "optical camouflage" videos @ Youtube. Weapons: I would like to think of UFOs as benign. However some UFO investigators (e.g. O.Fontes, F.Feschino, S.Friedman, T.Good, R.Pratt) have argued that fatal confrontations with the militaries of some nations have occured, when they tried to shoot at UFOs, as part of a "shoot 'em down" policy in the 1950s. P.Hill speculated that UFOs can use their gravity-like force field technology as a weapon, by focusing such a beam on the target and increasing the cyclic component to a very high frequency, causing the target's material to vibrate so fast that it effectively disintegrates. Water connection: UFOs appear more frequently at low altitude near bodies of fresh water, like lakes (e.g. the Great Lakes at the USA-Canada border are a UFO hot-spot), rivers (e.g. Hudson Valley USA 1983-1985), reservoirs and even swamps (e.g. the wave of sightings in Michigan USA 1966, includes the famous Hynek "swamp gas" incident, a term which became a national joke). UFOs are often reported to hover over lakes and ponds, and even dive or emerge from lakes and seas (e.g. on 19-Jul-1946 four unknown objects plunged into lakes in northern Sweden in the vicinity of Soederhamn, during the wave of "Spoekraketarna" or "ghost rocket" sightings over Sweden in 1946). UFO sighting databases list many cases of UFOs seemingly "sucking" water from lakes, rivers or reservoirs (e.g. New South Wales Australia Dec-1995, fishfarm with water in interconnected tanks in Japan, Parera La Pampa Argentina concrete water tank Oct-2005). In my country, Greece, there have been UFO reports near Agrinion's lake Trichonida (e.g. Volume #1 of the british magazine "Flying Saucer Review" published a sighting by two men driving a truck on a mountain road near Agrinion in 1955), lake Ioannina and lakes Volvi and Koroneia in northern Halkidiki. It was author Dr. Ivan T. Sanderson who in the 1970s suggested that aliens could remain undetected by building their bases beneath the Earth's oceans. He found that by actual count, over 50% of the UFO sightings he investigated had occurred over, coming from, or plunging into or coming out of water. This includes lakes, reservoirs, rivers and oceans. nocturnal habits: UFOs appear mostly at night. Formation: When multiple UFOs are observed, they are often reported to maintain a formation, e.g. 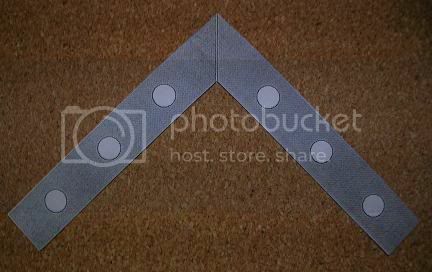 when there are 3 they often maintain an equilateral triangle formation. This is sometimes interpreted as a "huge triangular craft", e.g. Tinley Park, IL 2004.
time anomalies / time distortion: there are some witness reports of very close encounters, which hint towards "missing time" or "time dilation" phenomenon (todo: Gravitational time dilation). E.g. in the CE2 case of deputy sheriff Val Johnson, Minessota 27-Aug-1979, his car's dashboard clock, set correctly at 7 pm when Johnson had reported for duty, was now 14 minutes late and curiously, Johnson's wristwatch was also 14 minutes late). Related: J.Vallee's "reality transformation", Jenny Randles' "OZ Factor" a term used to describe the strange, seemingly altered state of being that is reported by some witnesses. They both link UFOs to "consciouness". [to check: Donald Pilz] Note that "missing time" in relation to the so-called alien abduction phenomenon is probably a different matter. IMHO the fact that some of these observations, reported quite consistently for 60 years and from nearly every country, do not conform to currently accepted physics (in particular reactionless / propellantless drive issues) is not the problem as skeptics suggest. Many have been suckered into this argument, that the observations have to comply with accepted physics theories before they can be accepted. This is untenable. If that had always been the criterion then physics would not have advanced one iota. The observations must be validated using other criteria, after which the physics must conform to these new observations, not vice versa. "An alleged "Flying Saucer" type aircraft or object in flight, approximating the shape of a disc, has been reported by many observers from widely scattered places, such as the United States, Alaska, Canada, Hungary, the Island of Guam, and Japan. This object has been reported by many competent observers, including USAF rated officers. Sightings have been made from the ground as well as from the air. Relatively flat bottom with extreme light-reflecting ability. Absence of sound except for an occasional roar when operating under super performance conditions. Extreme maneuverability and apparent ability to almost hover. A plan form approximating that of an oval or disc with a dome shape on the top surface. The ability to quickly disappear by high speed or by complete disintegration. The ability to suddenly appear without warning as if from an extremely high altitude. The size most reported approximated that of a C-54 or Constellation type aircraft. The ability to group together very quickly in a tight formation when more than one aircraft are together. Evasive action ability indicates possibility of being manually operated, or possibly by electronic or remote control devices. Under certain power conditions, the craft seems to have the ability to cut a clear path through clouds -- width of path estimated to be approximately one-half mile. Only one incident indicated this phenomenon. The first sightings in the U.S. were reported around the middle of May. The last reported sighting took place in Toronto, Canada, 14 September. The greatest activity in the U.S. was during the last week of June and the first week of July..."
Source: Brig.Gen. Schulgen "Intelligence Requirements on Flying Saucer Type Aircraft" 28-Oct-1947, a/k/a Schulgen memo [must-read! ], obtained under FOIA from the US National Archives in 1985. What is remarkable about this order is that it goes into very specific details about saucer construction. This primer was written by the late Charles W. Bahme, a former Los Angeles Fire Department deputy chief, who researched UFOs for years. According to Bahme, his interest was ignited August 26, 1942 during the so-called "L.A. Air Raid." After serving as security coordinator for the Chief of Naval Operations, Bahme went on to write the original Handbook of Disaster control in 1952, and the first Fire Officer's Guide to Disaster Control in 1978. Finally, in 1993, he teamed up with William M. Kramer, a district chief with the Cincinnati Fire Department, to write the current manual. "There are about 50 observations known from the time before World War II. Then the number of appearances increased; the Allies thought it was a German secret weapon, and the Germans thought it was one of the Allies. Since 1947, the reports of eyewitnesses increased considerably. It is said by the English Air Marshall Lord Dowding that there have been 10,000 (reports) by 1953." Sources and References: Books by Paul R. Hill, Richard H. Hall, James McCampbell, Leonard Cramp, UFO illumination and performance, Hall's "The UFO Evidence" 1964, UFOlogy Chapter 2: The Vehicles, NUFORC reports by Shape, Physical effects of UFOs upon people (.PDF), Odors from UFOs (.PDF), Landing trace cases, Interim Report 2004, Ted Phillips' Physical Trace Catalogue, Dr.Harder on magnetic effects, analysis of UFO luminosity, Measurements, Calculations And Experiments Related To UFOs and other links of this page.